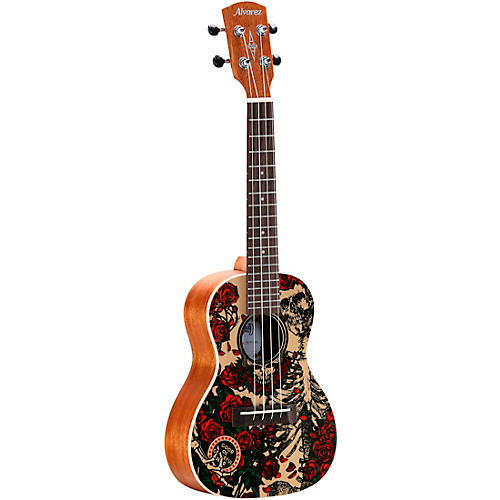 The Montage celebrates the Grateful Dead’s 50th anniversary and especially made for all the Dead fans who bought the montage guitar released in 2015, should they wish to own the set. The art draws upon a collection of wonderful Grateful Dead imagery. The sound hole incorporates the legendary Steal Your Face logo, originally designed by Owsley Stanley and Bob Thomas for the Steal Your Face (1976) album cover. A portrait o Bertha and her iconic roses also peers at us from behind the edges of the top, an iteration that first appeared on the band’s self-titled album Grateful Dead (1971), designed by Alton Kelley. The words “50 Years” are flanked by bold and familiar logos of the “Good Ol Grateful Dead” and a classic Dancing Bear. The Montage beautifully captures 50 years of the Grateful Dead’s iconic artwork, and is not only inspiring to look at, but inspiring to play as well.